Why spend money on expensive chocolates for your valentine when you can enjoy the satisfaction of making delectable truffles at home? Truffle making is not as complicated as you might think. The most important thing to remember when making truffles is: The better the quality of the ingredients, the better tasting the truffles. Heat orange zest and cinnamon stick with the cream in a saucepan; simmer until cream just begins to boil. Pour cream through a strainer to separate the orange and cinnamon. Pour hot cream over chopped chocolate in a large bowl; allow to stand for one minute. Whisk the mixture gently and steadily until it is entirely smooth (ganache). Cover ganache directly with plastic wrap to avoid exposure to air. Allow the ganache to set at room temperature for 3-4 hours or overnight. When ganache is firm enough to shape, use a melon baler or a teaspoon to scoop balls of ganache and place them on a foil-lined baking sheet. Place truffles in the refrigerator for 1 hour. Combine cocoa powder and cinnamon in a pie tin. 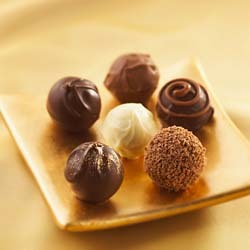 Coat hands in cocoa powder and roll truffles between hands to make round balls. Roll in cocoa mixture and place on baking sheet. Cover a baking sheet with foil and nonstick cooking spray. Beat cream cheese on med until smooth and creamy. Stir in cookie crumbs, raspberry preserves, vanilla and food coloring. Cover with plastic wrap and chill in the refrigerator for 1 hour. Combine crushed almonds and powdered sugar. Scoop and shape mixture into balls. Roll balls in almond mixture. Store in the refrigerator in an airtight container. Cover a baking sheet with foil and spray with cooking spray. Combine sugar, butter and milk in a saucepan. Bring to a boil over medium heat; stirring constantly. Once mixture has reached boiling point, reduce heat, stir occasionally and cook to soft ball stage (when candy thermometer reads 236 degrees). Remove from heat and stir in Andes mints until combined. Add the marshmallow cr�me and vanilla until fully incorporated. Pour mixture onto prepared cookie sheet and spread smooth. Refrigerate at least 1 hour. Cut mixture into small squares. Roll into balls and return to baking sheet. Melt chocolate chips in microwave. Use slotted spoon or 2 forks to dip balls in chocolate and return to baking sheet. Melt white chocolate in the microwave in a partially sealed re-sealable sandwich bag and add green food coloring. Squish bag to mix color. Use scissors to snip off a small corner of the bag and drizzle green chocolate over top of each mint truffle. Place in the refrigerator to set. Store in an airtight container for up to 5 days.